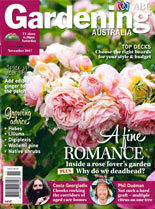 Our unique Invisifeet pot raisers have been featured in the renown Gardening Australia magazine’s November 2017 issue. Water accumulating underneath pots and saucers cause staining of the surface they’re sitting on, and causes rotting to timber surfaces like decks and steps. Made here in Australia, Invisifeet are small ‘feet’ that are placed under your pots, high enough to allow air ventilation to prevent staining and rotting, but not so big so that they appear invisible … like they’re not there at all! This was recognised in Gardening Australia magazine, that wrote Invisifeet are “discretely raise pots and saucers off the ground and are barely visible”. The Invisifeet pot feet by HomeLeisure are the quick and easy solution for saving the surfaces under pots and other items from staining and rotting. Simply place a minimum of four well-spaced underneath a pot and enjoy easy cleaning and guilt-free gardening. Pick up a pack of nine Invisifeet at Bunnings Warehouse stores nationally.